It may still be plenty cold enough for now to use our heating systems on a regular basis, but soon enough the temperatures will rise and you’ll be ready to use your air conditioner again. As a result, you might be tempted to put off any furnace care you may need or suspect. Of all the heating services you should never neglect, a late-season furnace repair is at the top of the list. Ignoring your heating system when it needs work done on it can have costly and inconvenient consequences—and may even threaten your safety. Of course, to know you need to schedule heating repairs, you need to know that they’re even necessary. If you notice any of the following signs, then be sure to reach out to our professional HVAC technicians. Your furnace is making groaning, banging, or whining sounds. The heat isn’t coming through as powerfully as it should be, even though your thermostat is turned up. Your energy bills have spiked from this time last year, despite comparable use. Your furnace keeps running without shutting off. This is probably what you’re wondering if you were able to check off any of the above signs. The truth is that there are a variety of things that can be going on within your furnace to cause these symptoms. It might be something as simple as a thermostat issue, and not a problem with the heating system at all. Even though a thermostat problem isn’t a complex need, it’s definitely not one you want to ignore. After all, you’ll need an effective and efficient thermostat to control your AC system on a daily basis pretty soon here! Other possible heating repair needs can be caused by damaged ductwork, clogged air filters, or potentially even electrical faults within the heater’s mechanical system. Neglecting these issues can cause them to grow worse. It’s best to tackle heating system troubles as soon as they crop up. This way you can avoid larger, costlier heating emergencies later on down the road. Can You Prevent Heater Repairs? Not every heating repair can be avoided. After all, sometimes it happens simply due to wear and tear. You can certainly reduce the risk of heating problems though, by scheduling maintenance at least once a year for your furnace. During your maintenance appointment, our technicians will fully inspect and clean your furnace, making any necessary adjustments and recommendations for repairs we see necessary. 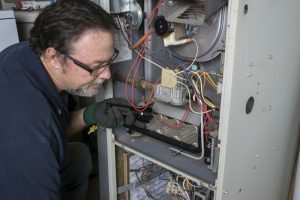 Maintenance helps ensure your furnace continues to operate as effectively and efficiently as it should, for as long as it should—and addressing any issues that come up is far more beneficial than waiting and risking a bigger emergency down the line. We recommend that this service be scheduled in the fall each year, before you need your heating system the most. But it’s more important that you have maintenance done on a consistent basis, no matter what time of the year it may be. Contact Shavitz Heating and Air Conditioning for professional Glenview furnace repair services, and more! Are You Heating Your Home as Efficiently as Possible?